Join us April 23 – April 29, 2017 at Creech Air Force Base, Indian Springs, Nevada for a 3rd national mobilization of nonviolent resistance to shut down killer drone operations in Afghanistan, Syria, Iraq, Pakistan,Yemen, Somalia and everywhere. Includes weeklong Camp Justice peace encampment. Alternatives to camping available. In the last two years we had nearly 150 activists each year join us from 20 different states across the country, including dozens of veterans. 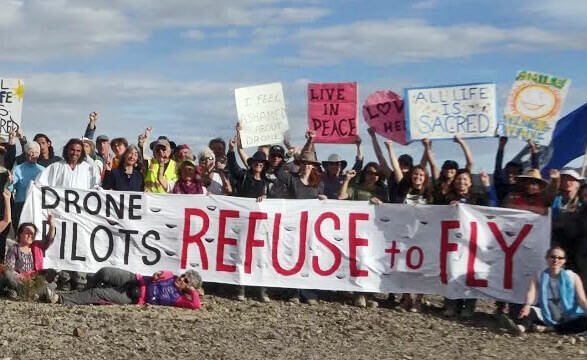 Both years, in multiple and successful resistance actions, we were able to nonviolently interrupt business as usual, with dozens who risked arrest and were arrested to stand in strong opposition to the illegal U.S. “targeted killing” program. Let’s make SHUT DOWN CREECH 2017 an even more powerful stance against the brutality of drone killing. Please join us, and help spread the word. Support people, who aren’t able to risk arrest, are equally needed. Come one, come all. Together we are PEACE! In 2005, Creech Air Force Base secretly became the first U.S. base in the country to carry out illegal, remotely controlled assassinations using the MQ-1 Predator drones, and in 2006, the more advanced Reaper drones were added to its arsenal. Creech drone personnel sit behind computers in the desert north of Las Vegas and kill “suspects” thousands of miles away. Recent independent research indicates that the identity of only one out of 28 victims of U.S. drone strikes is known beforehand. Though officials deny it, the majority killed by drones are civilians. Since 2009 dozens of activists have been arrested for allegedly trespassing at Creech, why attempting to peacefully interrupt the indiscriminate killing and burning of innocent people by drones.